American Justice is exposed once again today. American Court has declared Dr Afia Sidiqqi criminal in case of firing on two Americans in Afghanistan without any proof. Dr Afia Sidiqqi is an Pakistani women which was kidnapped from Karachi by American intelligence agencies with his three children. She was kept 3 years in Bagram Air base Afghanistan where she was tortured very badly and was treated in un-humanitarian way. Her 2 Children are still unknown where they are and are they even alive. Today American court has declared her Criminal without any proofs. 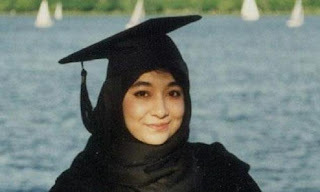 Sister of Afia Sidiqqi Fozia Sidiqqi has said that she is declared criminal on American intelligence agencies pressure because if she proved innocent American intelligence agencies would have proved lying. Mother of Afia Sidiqqi has said that i am proud of my daughter and she is innocent. She sad we will not beg for mercy from America.Dr Afia sidiqqi has said that i will request my Pakistani brothers and sisters not to do any harmful protest for country. Its a slap on so called American independent judicial system and Exposing American justice. a women which was tortured for so many years, and treated with every unhumanitarian, and most importantly her 2 young children are still unknown and you are declaring her criminal without any proof. Shame on you America and Shame on our Government.